Design your own style using Singer 7256 Fashion Mate. It is best known for its versatile and easier to use functions that feature larger varieties of stitches that are appropriate for every type of project. It can be the best tool for fashion sewing, heirloom, home and decorative sewing, crafts, and quilting. It is quite logical why this model is popular among a growing number of users. It has 70 built-in stitches with other impressive and useful features that make it productive. Most of all, the machine is easier to get up and operate. An automatic needle threader is provided to facilitate effortless threading using the machine. Thus, you will enjoy automatic threading of the eye of the needle. One-step balanced built-in buttonholes facilitates sewing in a single direction. Thus, it is easier to create prettily balanced buttonholes. Users also rave about the automatic tension, which ensures better stitch quality in any type of fabric used. The push-button stitch selection feature facilitates optimum settings. Tension and length width can be set automatically. You may select your desired stitch and proceed with the project in just a push of any corresponding button. Its StayBright LED white lamp illuminates the machine’s sewing surface for user’s optimal viewing. The bulb remains cool even if the machine is operating for many hours. 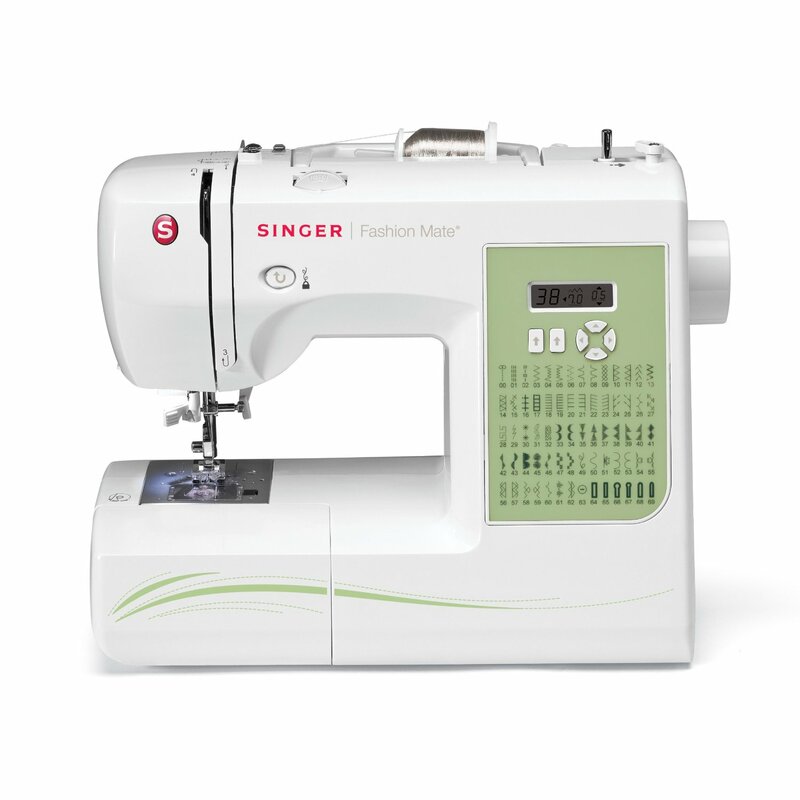 The Singer 7256 Fashion Mate comes with a 25-year warranty, with limitations. It covers 25 years for parts and 5 years for electronic components. Another year of warranty is for labor. The white LED lamp is expected to last up to 100,000 hours, which is covering almost the entire lifetime of this computerized sewing machine. It comes with a rigid internal skeleton support that holds mechanisms in alignment for total durability and for skip-free sewing. There is a removable extension table in every unit where users can store all accessories when not in use. There is a built-in control system that indicates when additional power would be required. This keeps speed throughout a project especially when changing thickness of fabric. The control system can be more useful for sewing multiple layers of fabric, including denim. Who should buy Singer 7256 Fashion Mate? The machine is suited for a budding fashionista and even for an experienced sewer. Anyone who can use sewing machine can find this one useful as it is simple and easy to use. For people who dislike the complications that come with most modern sewing machines, this is a good option. Consumers who prefer computerized free-arm sewing machines can opt for Singer 7256 Fashion Mate. It has 70 built-in stitches that facilitate basic, decorative, stretch, and one-step buttonholes. At a practical tag price, it is a good tool for sewers of any caliber. Anti-Spam Quiz: 4 + 6 = ?